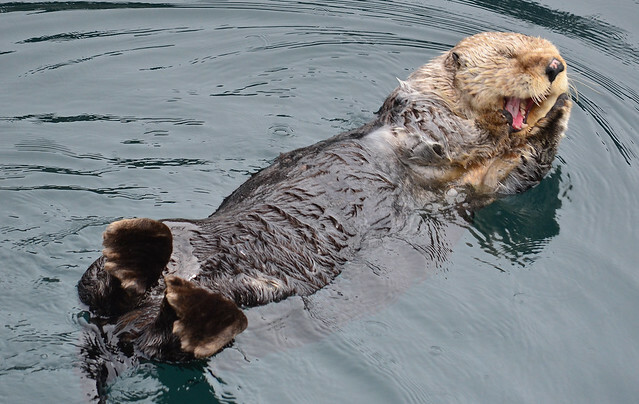 It’s a fuzzy, sleepy sea otter for you today, courtesy of James Brooks on flickr. Things are maybe slowly getting better? The spat linked to has all the usual suspects and arguments, but nice to see more and more people taking it seriously. The link about empathy being a core engineering value is important too. Place I used to work for had a motto “People with slow internet connections buy things too” and all websites they built had to work well for people on dialup. If more developers had an idea of how their users differ from themselves, life would be so much better. Zebee, thanks for the link. Nice argument. Tempted to re-open my Men Who Dance post in order to incorporate Tom Hiddleston. All that and Henry V too. Oh yes, he can dance like the dickens! Somewhere there’s a clip of an awards-show dance-off between him and one of the other Asgardians from the latest Thor movie. It’s delicious. I’m currently reading all the Philippa Gregory Cousin’s War (aka Wars of the Roses) series, because I watched the dramatisation The White Queen, and although/since/because I know my Plantagenet/Tudor history fairly well I wanted to see what she’d done with it. I admire the way she deals with her characters’ belief systems, most of which we would today classify as ridiculous superstition (whether church or pagan) yet for the people of the time were an essential part of their worldview. I particularly like the way she shows how partisan leanings determine whether various persons view any particular battle-winning storm as either the divine seal upon a godly prayer or the ill-wishings of a demonic witch, and note how although today’s political rhetoric is superficially more sophisticated it hasn’t fundamentally moved on all that far. So just in case anyone’s been put off the series by an early recounting of superstitious views on the part of some characters, I’d say the series is still very much worth sticking with. A shattering blow in the War against Pink. I currently have a wrist smothered in band-aids. Maddie does not approve of being put in her basket to go to the vet! She should be feeling mollified by now, having achieved Fame by being the first documented cat self-stacker. I thought this poetry slam entry was pretty cool, but it comes with a trigger warning for eating disorders. All the Hiddleston fans have seen “Fountain Pens that look like Tom Hiddleston”? AotQ, the fountain pens are awesome. Perhaps not quite so awesome as Mr Hiddleston right now, but close! Well, at least one rugby league player alleges that he can’t tell one blonde woman from another. I notice his account doesn’t seem to include an immediate “Oh my god, I’m so sorry!” which is what I’d expect from an actual mistaken identity. In other depressing media news, just about all British papers now seem to be reporting on the fraud trial of Nigella Lawson’s former assistants as if it were a trial of Nigella Lawson for drug taking.